This type of protection is used for protection of transmission lines Carrier currents of the quency range 30 to 200 kc/s in USA and 80 to 500 kc/s (kHz) in UK are transmitted and received through the transmission lines for the purpose of protection. The scheme diagram of carrier current protection is given in Fig. 1. Each end of the line is provided with identical carrier current equipment consisting of transmitter, receiver, line-tuning unit, master oscillator, power amplifier, etc. 1. Coupling capacitor. The carrier equipment is connected to the transmission line through 'Coupling Capacitor' which is of such a capacitance that it offers low reactance (1/ωC) to carrier frequency but high reactance power frequency. 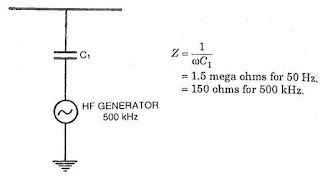 For example, 2000 pF capacitor offers 1.5 megaohms to 50 Hz and 150 ohms to 500 KHz. Thus coupling capacitors allows carrier frequency signals to enter the carrier equipment but does not allow 50 Hz power frequency currents to enter the carrier equipment. To reduce impedance further a low inductance is connected in series with coupling capacitors to form a resonance at carrier frequency. 2. Line Trap Unit. 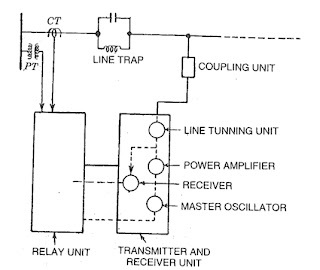 Line trap unit is inserted between bus bar and connection of coupling capacitor to the line. 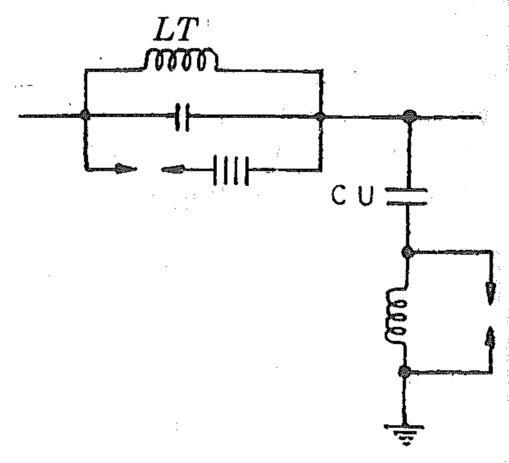 It is a parallel tuned circuit comprising L ans C. It has a low impedance (less than 0.1 ohm) to 50 Hz and high impedance to carrier frequencies. This unit prevents high frequency signals from entering the neighbouring line, and the carrier currents flow only in the protected line. Fig. 3 Line trap units. 3. Protection and Earthing of Coupling Equipment. Overvoltage on power lines are caused by lightning, switching, faults, etc. produce stress on coupling equipment and line trap unit. Non-linear resistors in series with a protective gap is connected across the line trap unit and inductor of the coupling unit. The gap is adjusted to spark at a set value of overvoltage. Base of coupling unit is earthed by earth rod in the vicinity to obtain low earth-resistance. Carrier panel usually installed in relay room is connected to station earthing system. i) Transmitter unit. ii) Receiver unit iii) Relay unit. i) Transmitter unit. Fig.5(a) gives the general arrangement of power line carrier protection scheme. 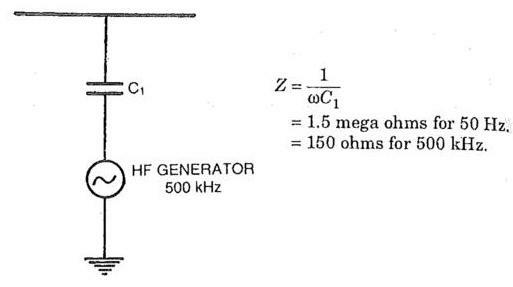 Frequencies between 50 to 500 kHz are employed in different frequency bands. Each band has certain band width (say 150-300kHz, 90-115kHz). Carrier frequencies are generated in oscillator. The oscillator can be tuned to a particular frequency selected for the application. Or it can be a crystal oscillator with which the operation for a particular band width can be achieved by selecting on appropriate crystal. The output voltage of the oscillator is held constant by voltage stabilizers. The output of the amplifier is fed into the amplifier to overcome the losses in the transmission path between the transmitter and receiver at remote end of the line. 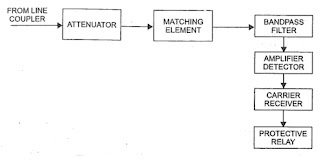 Signal attenuation comprises. - losses in coupling equipment which are constant in the given frequency range. - line losses which vary with length of line, frequency weather conditions, tee of connection of the line, the size and type of line. The h.f. losses of underground line are higher than overhead line. The losses in overhead line are affected by weather. In fair weather the attenuation is about 0.1 dB/kHz at 80 kHz rising 0.2 dB/km at 380 kHz. 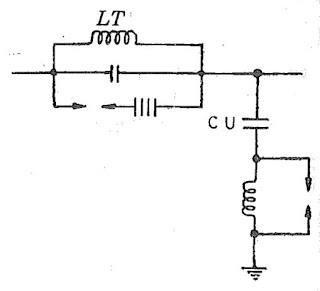 The output of amplifier is of the order of 20 W for a 250 km line. The amplifier should be designed for maximum power over a selected bandwidth. The control of transmitter can be achieved by different methods depending upon the type of protection desired. Amplifier constantly energized transmission initiated by energizing the oscillator. In this method the oscillator stability and response time is a constraint. Amplifier and oscillator constantly energized and the signals are initiated by interconnecting the oscillator to the amplifier. The control circuit switches the device which interconnects the oscillator. (ii) Receiving unit. The high frequency signals arriving from remote end are received by Receiver. The receivers, the signals sand feeds to carrier receiving relay unit (Fig. 6). Receiving unit comprise. - An attenuator, which reduces the signals to a safer value. 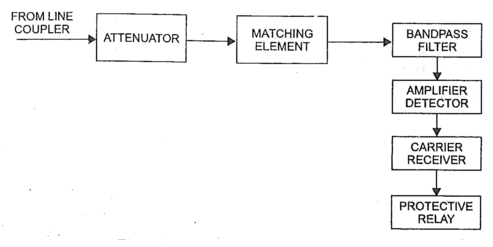 - Matching transformer or matching element to match the impedance of line and receiving unit. The spurious are caused by short-circuits, radio interference. To avoid the mal-operation due to noise, a setting above 2 milliwatts recommended is given to the receiver. This setting is above the noise level. To avoid operation due to spurious signals, the carrier signals should have higher power level (20 W) and receiver should be set at higher level (5 milliwatts). Before feeding the signals to amplifier detector, the signals should be attenuated to avoid overloading. (ii) Frequency spacing. 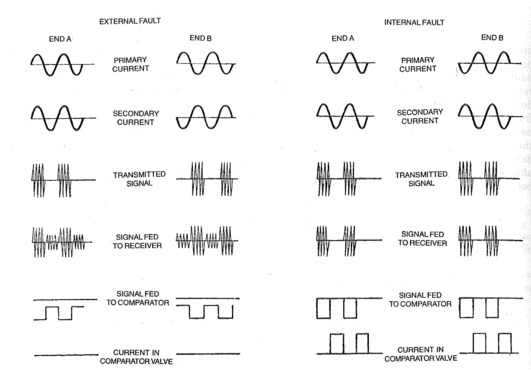 Different frequencies are used in adjacent line sections. The wavetraps ensure that the carrier signals do not enter the next line section. The receiver filters filter-out other frequencies. The choice of frequency bands for various section should be co-ordinated. (iv) Modulation of high frequencies signal. The modulator modulates 50 Hz signals and the modulates signals is fed so the amplifier and is then transmitted via coupling unit (Fig 7). The process involves taking half cycle of current and producing the requisite blocks of carrier (Fig. 8) by turning the oscillator on. The level of line current at which the oscillator is made on to produce the carrier blocks should be theoretically constant. However, in practical there is a critical minimum current. Phase comparison method compares the phase relation between current entering in the protected zone and current leaving the protected zone. The magnitudes of current are not compared. Phase comparison provides only main protection. Back up protection should be provided in addition. In one of the phase comparison methods signals are sent from each end of the line and received at the other end. The signals are related to the current flow in the main line, as they are divided from CT secondary current. Where there is no fault, the signal is sent for alternate 1/2 cycles from each end which result in continuous signal over the line half the cycle from one end, remaining half from the other. The same condition holds good from an external fault. During internal fault the current in one of the line reverses in phase or differs in phase and remains below the fault detector setting, so that carrier is sent only for half the time. The relay is arranged to sense the absence of signal in the line. Depending upon the setting, the tripping occurs when the phase angle between the two signals reaches a certain value. Referring to Fig. 10, for internal fault condition shown on right hand side, the transmitted signals and receiver signals are almost in phase. The comparator compares these signals. 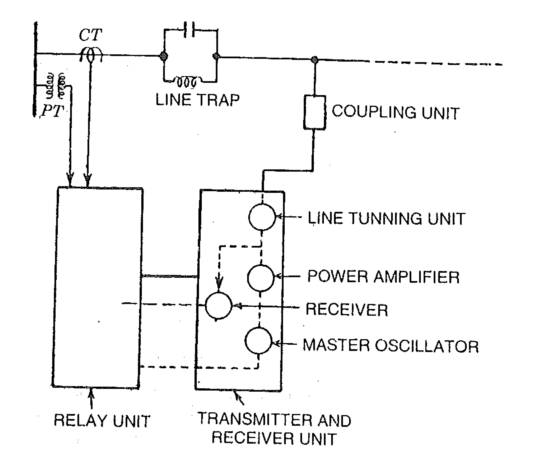 Due to absence of signals of alternate half cycles, the comparator gives output causing operation of trip relay. Carrier signals are transmitted to the line from both ends. For external faults the effect produced by the sum of these two signals is similar to that obtained when a continuous high frequency carrier is available on the line, and the protection is designed to remain stable under the condition. 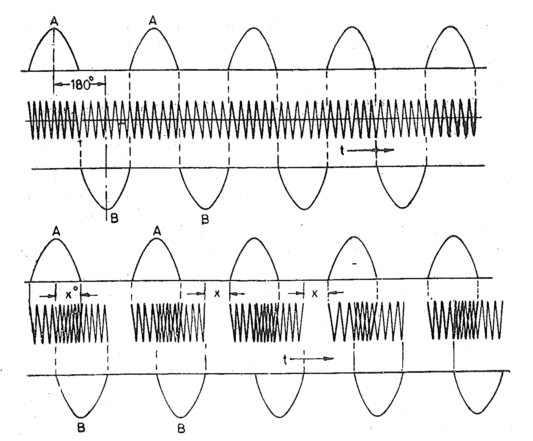 The sum of these two signals on all internal faults produces produces and effect similar to the periodic suppression of such a continuous carrier, the duration of each suppression being proportional to the phase displacements greater than a normal angle 30o. Thus for displacements less than 30o the protection will stabilise. This angle is usually referred to as the stabilising angle of the protection (angle X in Fig.10(b)). Fig. 10(a) illustrates the two extreme cases with symmetrical fault conditions. The external fault condition is implied by the fact that the primary current at both ends is in phase and the internal fault condition by the fact that the two primary currents are 180oout of phase. As a first step to produce the required carrier signals the secondary current at one end only (end B) is made 180o out of phase with the primary current by the reversal of the current transformer connections. 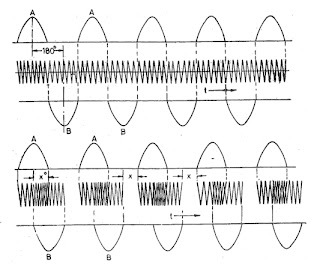 Thus for external faults the secondary currents at the two ends are 180oout of phase with each other (Fig 10(a)). It will be seen that the carrier-signal produced at both ends takes the form of a continuous carrier which is periodically suppressed. 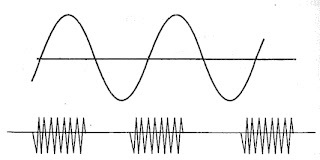 In other words, a high frequency signal is only transmitted on alternative half-cycles of the power-frequency corresponding say to the period when the secondary current is positive. 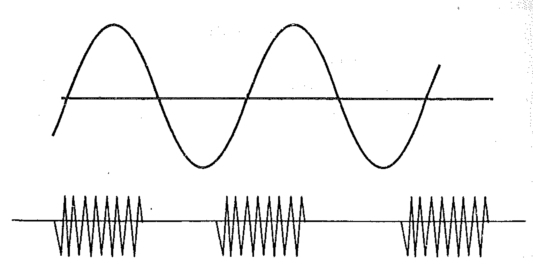 The type of high frequency signals is achieved by a process of modulation, whereby the normally consistent magnitude of a high frequency carrier is made to vary in accordance with a square wave-shaped derived from the power current and having the same period (Ref. Fig 8). 1. Fast, simultaneous operating of circuit-breakers at both ends. 2. Auto-reclosing simultaneous reclosing signal is sent thereby simultaneous (1 to 3 cycles) reclosing of circuit breaker is obtained. 3. Fast clearing prevents shocks to systems. 4. Tripping due to synchronizing power surges does not occur, yet during internal fault clearing is obtained. 5. For simultaneous faults, carrier current protection provides easy discrimination. 6. Fast (2 cycle) and auto-reclosing circuit breakers such as air blast circuit breaker require faster relaying. Hence, the carrier current relaying is best suited for fast relaying in conjunction with modern fast circuit breaker. (a) Station to station communication. In power station, receiving stations and sub-stations telephones are provided. These are connected to carrier current equipment and conversion can be carried out by means of "Current Carrier Communication". (b) Control. Remote control of power station equipment by carrier signals. Radio links are used for all forms of protection otherwise based on power line carrier or pilot wire. The transmission is generally by line of sight and this must take into account the curvature of the earth and topology of the route cover which the transmission takes place. The suitable range is about 60 km. Frequency bands used are of the range 80-170 MHz, 1500 to 7500 MHz. The transmitters and receivers are controlled in the same manner as the carrier current transmitter and receiver. With radio links (microwave pilots) the signals are sent by line of light antenna equipment. Thus the coupling and trapping units are eliminated. In U.S.A., radio links are used for communications, remote control and protection. These are most expensive, but give fast and reliable service. - Pilot (pilot wire, power line carrier, or microwave). Graded time lag and grade current overcurrent protection is used for single radial feeders where time lag can be permitted. Distance relaying is based on measurement pf impedance between relay location and fault point. It has three types namely impedance type, raectance type. mho type. The relay operates if the impedance is below the set value. Distance relay is used where time lag can not permitted. Differential protection is of unit type. It gives fast relaying. Pilot wire differential relaying used for lines upto 40 km of length.